Here's a video of auto-wirebonder in action, in slow motion. Check out the complex trajectory that was programmed to make a loop for stress relief. RF wirebonds (mainly from interconnect substrates to MMICs and RFICs) are a key part of microwave engineering. Unfortunately, they never seem to get the worthwhile treatment in coursework or in actual designs. 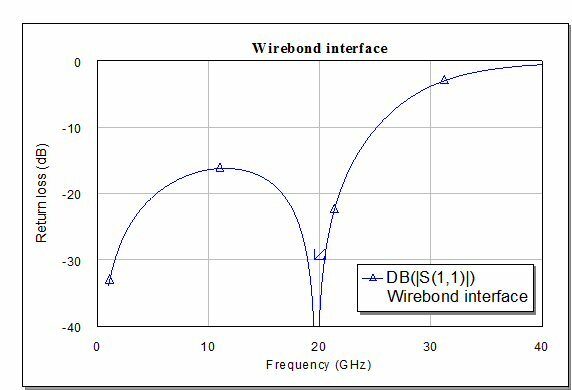 RF wirebonds present a problem that is going to get more attention in the future: wirebonding above 40 GHz comes with a lot of baggage that gets heavier and heavier with frequency, and is too hard to lift at 200 GHz. How many times have you read a paper or watched a presentation on an amplifier that operates above 100 GHz, and the author or presenter provides only RF probe data and does not consider how the circuit would be used in the real world? Too many to count, it you attend IEEE IMS, RFIC or CSICS conferences. On this page, when we speak of RF wirebonds, we refer to connections that are supposed to maintain system impedance, for example in a 50-ohm system. Other types of RF wirebonds include wires used to connect to chicken dots. For 25um diameter gold wire, the inductance will be approximately 1 pH for every micron of length. For example, a 200um wire will have 200 pH inductance. If you used thinner or thicker wire (or ribbon), the inductance will have to be scaled slightly. If someone wants to provide some input on scaling the rule of thumb, please send it our way. 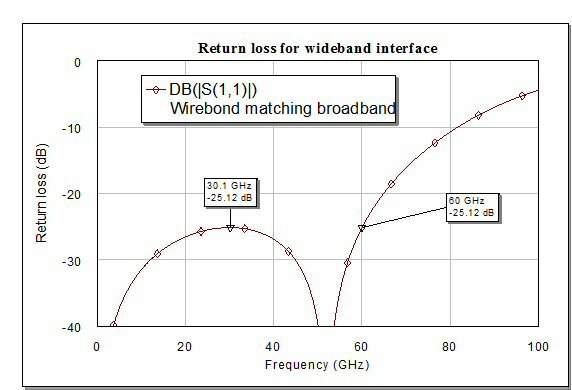 A well-thought-out RF wirebond involves impedance matching, in a low-pass circuit. If you thought you can ignore the capacitance that is required to match the wire, you have probably never worked above X-band. The time-tested method of passing a signal through an inductor and matching it to Z0 is to to create a low-pass filter structure by hanging two shunt capacitors from the inductor in a pi circuit. In the case of matching out a wirebond, you don't use actual capacitors, you will use capacitive elements that are short sections of low impedance line. The lumped element equivalent ideal circuit is shown below. In this circuit, we did a little math such that the exact resonant frequency can be specified as an independent variable and inductor and capacitor values are calculated. In this manner, we have calculated the maximum inductance that can be absorbed by two capacitors. If you are too lazy to do the math yourself, go to our resonant frequency calculator, enter an inductance and frequency and the calculator will provide the required capacitors for this simple low-pass filter circuit. In tabular form, the maximum inductance you can match out is shown below. Using 25 micron diameter wire, you can also read "Lwb" as inductance in pH, or length in microns. This means at 160 GHz you can only have 50um long wires before you lose performance. Who is interested in D-band? NASA, for one (at least until the new administration cracks down on Earth Science missions). Do you think they are going to be happy to send your circuit design into orbit with 50um long wires? What could go wrong? Did you ever hear of temperature cycling, and thermal expansion? One of the benefits of wirebonds is that they provide stress relief because of that nice loop that you can see in the video at the top of the page. A 25um diameter wirebond that is 50um long has no loop, and therefore is terrible at stress relief. Good luck with that, amigo. 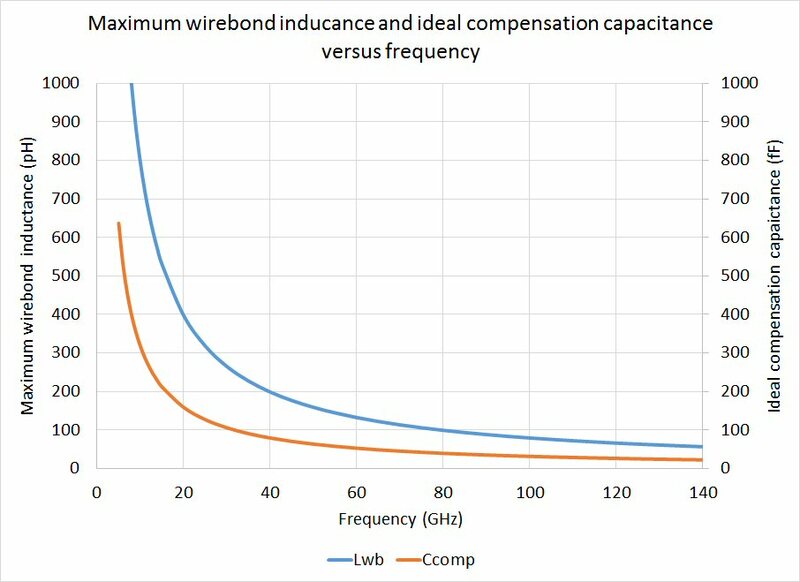 Maximum inductance and compensation capacitance versus frequency are plotted in two lines below. The inductance has a steep knee in the curve, this is the kind of curve that is so nonlinear it does not flatten out on a log or log-log scale! You can pretend that uncompensated inductance at the input and output of your circuit does not matter, and accept reduced performance. The way we look at it, at 140 GHz, wirebonds are hosed. No one should be proposing wirebonds above 94 GHz, and everyone should be thinking of other options starting at 40 GHz. You have to start looking at flip-chip or other direct connections. 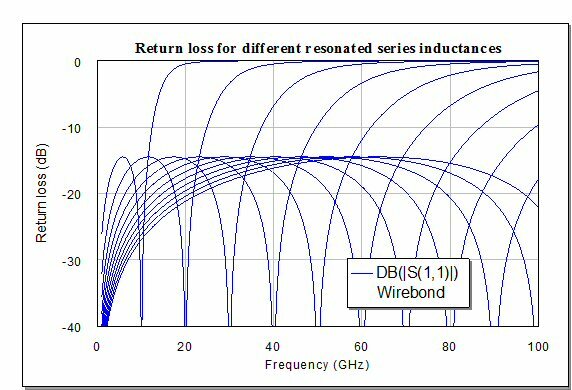 The next figure shows return losses of wirebonds that were resonated out at 10, 20, 30, 40...100 GHz. Note that if you are looking for wideband performance, you don't want to fully resonate at your upper frequency (more on this below), if you follow the fully-resonated technique, you will suffer 14 dB return loss in the middle of the band. 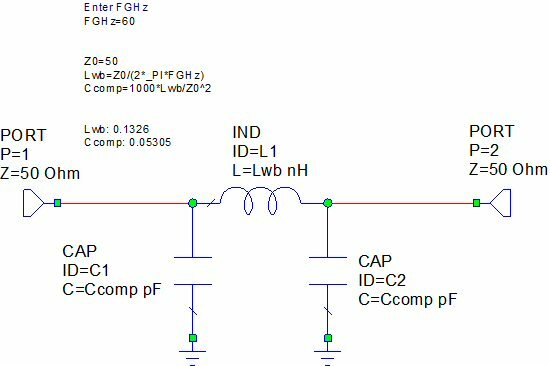 What might a wide-band wirebond interface look like? Its the same thing but with reduced capacitors. Below, we threw in a scale factor for the capacitors, and messed with it until we had the best possible return loss over 60 GHz bandwidth (minimum 25.12 dB), which you will see in the accompanying plot Funny thing, the scale factor works out to the Number of the Beast, plus an additional six thrown in for good luck. Thanks, again, Mr. Beast, you have protected the Unknown Editor for 1,000,000 airline miles with your number on his frequent flier card! A little history is in order... the first known reference to matching out wirebonds with capacitive flares was by Texas Instruments, during Darpa's MIMIC Phase II program. Younger engineers should be warned that mere mention of this program to a 60 year old microwave engineer will immediately cause tears, when he/she remembers the days when you could not spend money fast enough when participating in this huge helping of government pork. Here's a Microwaves101 $50 Challenge: be the first to find and send us an image of TI's compensated wirebonds from a MIMIC Phase II report and we'll send you a check, and not report this income to the IRS. We have no idea if such an image is available on the ol' web, but the place to start is the DTIC website. Good luck! Even if you don't find anything, you will see a lot of awesome documents that are available for free. Shown below is an image we borrowed from the J-micro web site. They make those little alumina pieces that allow you to RF probe a device that does not have GSG interfaces, which are very useful! Unfortunately, this part has not been wirebonded, we need to add an image to show you the correct way to reduce inductance with two wires in a V-shape, which is another subject that we will cover later on this page. Below is a Microwave Office model of an interface between 10 mil alumina (254um) and four mil GaAs (100um). The bond pads are separated into two components of the same width, the junction between them epresenting where the wire touches down. 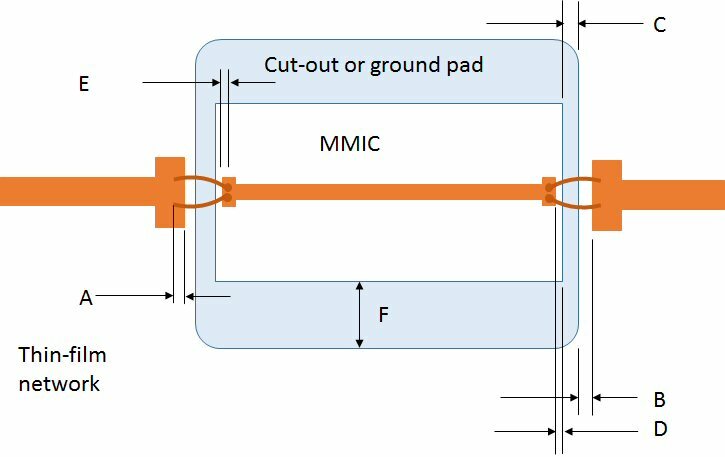 We will refer to the touch-down area on the alumina substrate as the flare (not flair, that is a pen) and the touch-down area on the MMIC as the RF bond pad. We allowed the length and width of the flare and bondpad to be variables for optimization with a fixed wirebond inductance. Suppose you were interested in 20 GHz and wanted to use the maximum wirebond inductance of 400 pH. You can put a goal up at 20 GHz for high return loss and let the optimizer out of its cage. The four variable values in the schematic represent this case. Below is the return loss after a few minutes of random optimizations on a reconditioned laptop, attempting to create a dip at 20 GHz. We nearly matched the ideal case. Most MMIC suppliers don't do justice to wirebond compensation with their data sheets. Their apps people will mumble something about "the inductance is absorbed into the design" which is wishful thinking and an indication that they really don't know that level of detail about the design nor do they want to be bothered by your stupid questions. Your best bet is to request an evaluation board and do your best to copy what the designer did, in the case that he/she put flares on the RF lines. When RF probing MMICs, you will get different data that when they are wirebonded in an assembly, because the low-pass filter structure is incomplete. It is not considered cheating to massage the RF probe data to add in wirebond inductance and compensation capacitance. However, if you are RF probing large signal data such as output power and efficiency, there is no easy way to correct the data and you should just accept that it will be slightly off and (hopefully) will improve when assembled. You will have to create a "correction circuit" in a linear simulator, that models the missing wirebond and flare or its equivalent capacitance. Then you will need to cascade it with all of the RF data you gathered. This is not usually a simple task, but there are people out there that are good at data manipulation, you should hire one. RF designers have enough to do already! 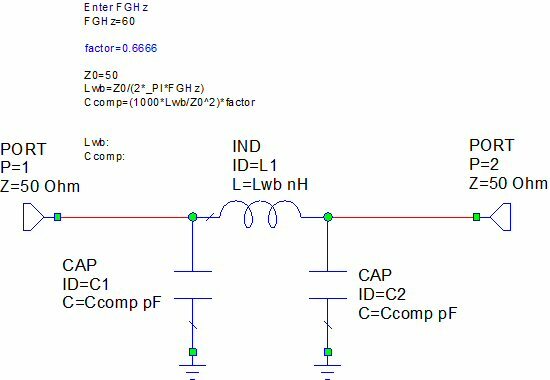 Now that you know how to design a proper compensated wirebonds interface, it is time to discuss the "V-bond" which is often used to reduce inductance. By placing two wires at the interface and spreading them a little, the inductance per unit length can be reduced. Note that in this case, while you are placing two inductors in parallel, the net value does not decrease 50% due to mutual coupling. The best you might accomplish is perhaps 0.75 pH/um as opposed to 1 pH/um for a single wire. The image below shows the correct placement of V-bonds. The two wires will share the RF pad on the MMIC in close proximity, as it is a small pad. When they get to the flare, they are bonded close to where the 50 ohm line meets the flare, spreading them out into a vee-shape. The chip can be mounted in a cut-out in the thin-film network (TFN) or between two TFNs. You could make a ground pad on top of the TFN using via holes, but that would add inductance in the ground plane that adds directly to the wirebond inductance, so don't try that above X-band. Let's look at some dimensions and try to add up the length of the wires. Note that dimension F is a don't care, you should always oversize the ground pad or cutout in the Y-dimension as a good engineering practice, it will come in handy for scrubbing the chip during attachment, or for tweezer clearance. In the end, you will soon see that 400um a practical lower limit for wirebond lengths, unless you do some very tight tolerancing on TFNs and heat spreaders which will come at considerable expense. How's that E-band radio dream looking now? One path toward millimeterwave frequency is to reduce tolerances of the entire geometry. Have you considered PolyStrata micro-coax?